Twin sisters Delphine (Catherine Deneuve) and Solange (Francoise Dorleac) teach ballet and music in their hometown of Rochefort but dream of finding success and romance in Paris. When the fair comes to town, the sisters meet two carefree carnies, Étienne (George Chakiris) and Bill (Grover Dale) who visit the café in the town square run by the girls’ mother Yvonne (Danielle Darrieux). Yvonne pines for her ex-fiancé who she left impulsively ten years previously because he had the embarrassing surname “Dame”, which would have made her “Madame Dame”. What she doesn’t know is that the same Monsieur Dame (Michel Piccoli) has recently returned to Rochefort to run a music shop frequented by her daughter Solange. Another regular at the café is Maxence (Jacques Perrin), a sailor currently doing his military service, whose portrait of his ideal woman closely resembles Delphine. When Delphine sees the picture she asks the gallery owner who the artist is, but, because he himself is in love with her, he refuses. Meanwhile, Solange meets and instantly falls in love with Andy Miller (Gene Kelly), a famous composer who is in town to visit his old friend Monsieur Dame. Yet no sooner have they met than they lose each other in the crowds. Will these star-crossed lovers ever find true love or will fate forever conspire to keep them apart? For Jacques Demy the opportunity to make an extravagant tribute to the Hollywood musicals that had so enchanted him in his youth was a dream come true. The critical and commercial success of the Palme D’Or winning Les Parapluies de Charbourg (Umbrellas of Cherbourg, 1964) meant he could count on a bigger budget for his next venture. Seizing his opportunity, Demy devised a story on a grander scale than its predecessor, one that would feature not just singing, but also dancing, multiple interwoven storylines, and roles for some of his favourite actors. It was a bold ambition but Demy and his key collaborator, composer Michel Legrand, had never lacked self-confidence and they had the talent to back it up. Together they succeeded in creating what many regard as the best French film musical ever made. Much of the film’s unique character arises from its location. D’Avignon, Hyeres, and Toulouse were all considered but as soon as Demy and his wife Agnès Varda caught sight of Rochefort with its classical military architecture and expansive central-square they knew they’d found the perfect place against which the events of the story could play out. Even so production designer Bernard Evein felt it necessary to repaint 40,000 square meters of the city’s facades, including 100 shutters, in pastel colours, before it took on the soft-hued appearance suited to the film’s aesthetic. Having found his dream location, Demy set about hiring his dream cast. As the “pair of twins born under the sign of Gemini”, Catherine Deneuve, the lead from Umbrellas, and her older sister Francois Dorleac, were the perfect choice. Demy sent them off to London before the shoot to prepare their routines with the English choreographer of the film Norman Maen. In the role of their mother Yvonne, Demy cast one his favourite actresses, Danielle Darrieux, an actress whose career stretched back to the 1930s and opposite her the ubiquitous but always memorable Michel Piccoli. From America he recruited dancers George Chakiris and Grover Dale and of course Gene Kelly whose presence above all evokes the Golden Era of MGM musicals. Kelly’s choreography of his own numbers is as inspired as any of his earlier work. Unfolding over the course of a long weekend, the film’s plot revolves around chance encounters and failed connections. There are five or six interconnected storylines with thwarted desire as a common theme. Although unlike Demy’s more melancholy earlier films, optimism wins out this time around. Yvonne’s café in the square is the hub of all the complex comings and goings and from within its big glass windows we are kept in constant connection with the world outside. A dreamer but also a realist, Demy never draws a line between fantasy and reality but allows both to occupy the screen at the same time. Indeed, unlike many musicals that shift back and forth awkwardly between spoken dialogue and song, the film flows effortlessly from scene to scene, never losing pace or focus. 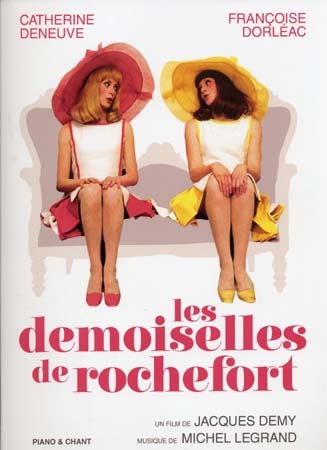 Watching Les Demoiselles de Rochefort is a genuinely uplifting experience. Propelled by Michel Legrand’s brilliant score – a blend of big-band swing and string-backed vocal numbers – its virtually impossible not to be swept up in the exuberance, the colours, and the emotional ebb and flow. There’s a lightness throughout, sometimes tempered by sadness or absurdity, but always engaging. Some of the dance routines may not be perfect but somehow this only adds to the film’s charm. As Godard had done with film-noir, Demy captures the spirit of the Hollywood musical, if not its well-drilled rigour, reimagining it in a French context and filtering it through his own sensibility. Released in 1967 when many were more interested in revolution than a musical about what it is to be in love, Desmoiselles received a lukewarm reception. Pauline Kael wrote that “a movie like The Young Girls of Rochefort demonstrates how even a gifted Frenchman who adores American musicals misunderstands their conventions.” Another wrote “the film falls to pieces whenever anyone begins to dance, and since someone is always dancing, it ends as a pile of pretty rubble.” Nevertheless the film was a success at the French box office and over the years has continued to find a loyal audience. In 1996, after a full restoration overseen by Agnès Varda, the film was re-released around the world to universal acclaim.